New Delhi: The digital advertising spend is estimated to grow at a compound annual growth rate (CAGR) of 30% to touch Rs12,046 crore by 2018, on the back of increased consumer trust in online ads, said a report jointly published by the Internet and Mobile Association of India (IAMAI) and Kantar IMRB. 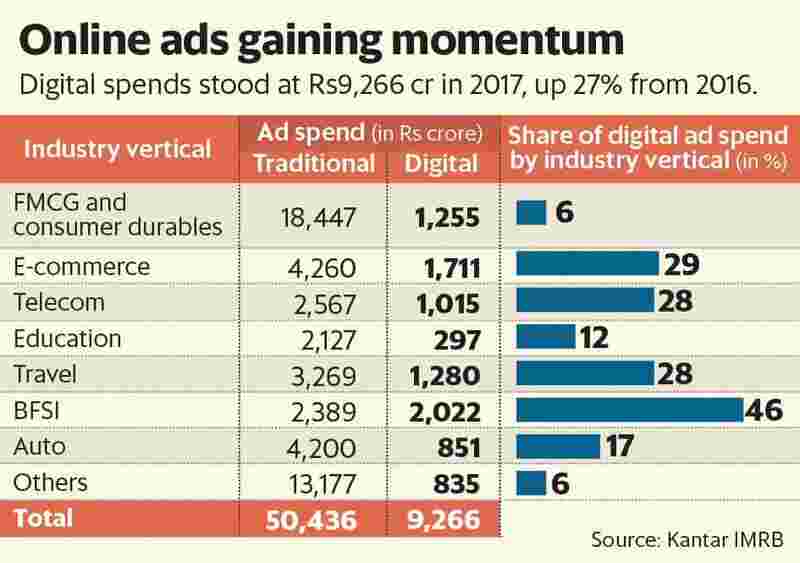 The share of digital spending is expected to be about 16% of the total ad spends estimated to be around Rs59,000 crore this year. Digital spends stood at Rs9,266 crore in 2017, growing at 27% over 2016. Noting that the relevance of digital advertising has gone up as consumers have started trusting online ads, Subho Ray, president, IAMAI said: “The proportion of internet users who believe that online ads are informative and that they help them in finding the right product or service they were searching for, is greater than in 2016." Currently, search takes the lion’s share of digital ad spends (27%) followed by video and mobile (19%), social media (18%) and display ads (16%). The report titled Digital Advertising in India 2017 stated that spend on mobile (which includes both SMS and in-app ads) recorded 34% year-on-year growth from Rs1,314 crore in 2016 to around Rs1,761 crore in 2017. Advertising on mobile is considered to be innovative which conveys the message clearly. Marketers are also actively exploring in-app advertising since it is believed to fetch better monetization. Apart from mobile, video ads emerged as the second fastest growing advertising format registering a 28% year-on-year growth from ₹ , 387 crore in 2016 to ₹ 1, 779 crore in 2017. “Video ads are considered to be a great branding tool. They have an enormous power to connect with the consumers," said IAMAI’s Ray, adding that companies are adopting programmatic advertising and advanced analytics to enhance the consumer experience on mobile. In terms of brand categories, Banking, financial services and insurance (BFSI) is the biggest spender on digital media with 46% of its overall spends on digital followed by e-commerce (29%), telecom (28%) and travel (28%). The report stated that there has been a growth of ‘native ads’ as they operate as a connector between advertisers and publishers. The advertising format not only provides consumers with content, it also does not disrupt their online experience hence is more likely to be seen by them. Sanjeev Jasani, chief digital officer at ad agency Cheil India said that more smartphone penetration and cheap access to Internet are going to be the key drivers of growing digital ad spends. “These have led to drive more and more searches and content sharing," he said. An earlier GroupM report stated that digital continues to be the fastest growing medium registering 30% growth rate, while Publicis Groupe-run media agency Zenith India predicted a relatively modest growth in internet advertising which it said will grow at 20.4% in 2018.